Stop Calling Me an Influencer! Lately, I’ve been seeing way too many people calling themselves “influencers.” Brands are confused. People are confused. It’s a big mess! I, Vincenzo Landino, AM NOT AN INFLUENCER! I had this conversation recently. I’m the Creative Director of Aftermarq, a content marketing firm specializing in video. But I’m also a photographer, videographer, winemaker, cosmetologist, blogger and so much more. If you call yourself an influencer, chances are, you may not be. If you don’t think you need to put actual work in, leave now. For the purposes of this piece, let’s also define what influence is, so there is no confusion. Vocabulary.com says, “Influence is the power to have an important effect on someone or something.” If someone influences someone else, they are changing a person or thing in an indirect but important way. Celebrity endorsements are typically transactional in nature—that is, they’re paid endorsements. The exception to that is when a brand is so perfectly aligned with a celebrity that it’s a natural fit. It’s the exception rather than the rule. One very famous exception was Paul Harvey, who used to have some of the highest ad rates in the industry. And yet, his paid influence was significant. Why? Because he only endorsed products that he believed in, and his listeners could tell by his sincerity. Social media influencers typically have a closer relationship with their audience than celebrities do. They’re expected to be authentic and therefore are more trusted. This is why influencers and brands need to be careful about crafting arrangements that seem off-base: because the audience will see right through it if it’s not authentic. Influencer marketing has been around much longer than recent years when social media has taken it to astronomical heights. Maybe the name wasn’t the same, but the game is. These are some of the largest celebrity endorsement deals in the history of endorsements. In fact, in most cases, the celebrity became so synonymous with the brand that it’s hard to differentiate the two. But the question still stands: does this make them influential? 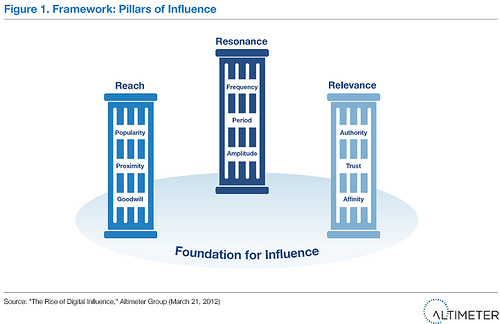 Brian Solis coined the term “Pillars of Influence” describing it as reach, relevance and resonance. Influencers are more than just popular people, they incite action. Did you buy Pepsi because Beyonce is associated with it? You thought about it. Did Michael Jordan or Tiger Woods cause you to think you can play basketball, or golf, and buy Nike? I know it worked on me! What these individuals possess is celebrity. Celebrity, in turn, gives them reach and relevance and the right deal will create resonance with the audience. They are inspiring people to take action, therefore, have influence. Being an influencer, while it sounds really cool, is actually a lot of responsibility. Back to Mr. Solis’ Pillars of Influence, resonance is the one Pillar that will incite the action. If what you’re slinging doesn’t jive with the audience, you and the brand lose credibility. Sorry, friend, it doesn’t quite work like that. Remember what I said about celebrities. While they have celebrity status, they have attained that through a skill or talent they possess and have worked hard to achieve. Michael Jordan is known for spending countless hours in the gym to become the legend he became. Tiger Woods started at a young age and continued to focus on his craft. Countless numbers of musicians, artists, athletes, actors and actresses spend hours on end perfecting their craft to earn the right at becoming a celebrity, and in turn, charging for their influence. Why should it be any different with micro-influencers like those in the social media space? You cannot simply be influential without being good at something. Anything! That’s where you can decide what space you want to play in. I’m Not A Celebrity, How Can I Ever Be Influential? You’re already thinking too big, and I’m not referring to dreaming big, you’re just not looking at what is right in front of you. Are you a whiz in the kitchen? Start creating content that displays your creations. Love taking photos? Be sure to share those great shots with consistency using social media or a blog. Are you always up to date on the latest and greatest technology? Virtual unboxings and reviews are extremely helpful to curious consumers! Virtually any experience you possess can be turned into influence, regardless of audience size. Malcolm Gladwell wrote in Outliers that you need 10,000 hours of work, education, and experience in your area to gain the true expertise of a world-class performer. This is the most difficult thing for people to understand. You don’t just wake up one day and people will begin clinging to every word you say. Unless you’re Forrest Gump and people just start following you everywhere. In that case, just keep running! Action. That is the result of true influence. Identify your skill or talent. Find that one thing you are extremely passionate about, something you could share every detail about and do it for hours on end, day after day. If something hasn’t rolled off your tongue before finishing that last sentence, don’t even bother continuing. Create content consistently. One major misconception is that one piece of content or one social media post will change your life. While that may be true for Chewbacca Mom, I want you to get it out of your head. Things like that happen rarely, and aren’t sought out as an end result. By creating consistently, you determine your own relevance. Be social. There’s probably nothing worse than creating an awesome video and having no one watch it. Don’t be afraid to share your content across all of your social networks. Additionally, appropriately tag relevant brands and individuals to alert them to what you are doing. Be smart here, don’t bring people into the conversation that your content won’t resonate with. At the same time, you want to be sure to engage with those that are viewing and sharing your content. Use software to do the dirty work. Do things like a media kit and user demographics scare you? That’s ok! Tools like TapInfluence have identified the key pain points influencers experience when trying to work with brands, and they’ve created an end-to-end solution to remove those annoyances, so you can focus on engaging with followers. Patience is a virtue. I know this may be a hard pill to swallow for the want-it-yesterday generation, but, patience is a tremendous asset and time is truly on your side. Buying followers or gaming the system may look great to some brands, however, you’re setting yourself up for failure. Growth through patience, quality content and good networking will line you up for bigger wins down the road. So stop worrying about having the title of “influencer”. Hone your skills, create a community of engaged followers and provide them value in all you do. Remember, becoming an influencer is a journey, not a destination. It takes skill, consistency and patience to earn that responsibility. Once you’ve earned it, you’ll soar to new experiences and heights like never before. Until then, keep creating and leave your mark. 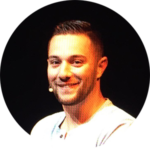 Vincenzo Landino is an entrepreneur, speaker and host of the Brand Boost Podcast. He is the the co-founder and Creative Director of Aftermarq, video content consultants specializing in brand amplification and digital storytelling. With experience as a brand correspondent, Vincenzo’s portfolio includes a 1 billion impression campaign launch for Applebee’s as well as work for Mazda, Kia Motors, Paul Mitchell Schools, Barilla Pasta, DC United, Tinder, and Zoomph.